For the first time ever, the 2016 Regional Airline Association (RAA) Annual Convention is being held in the Queen City of Charlotte (May 9-12th), and STS Aviation Group is set to exhibit at Booth 555. Choosing Charlotte to host this year’s annual convention makes sense. Charlotte is one of America’s central aviation hubs with a state-of-the-art airport that boasts more than 700 domestic and international departures everyday, many of which are operated by RAA’s member airlines. The RAA Annual Convention serves as an important support network that connects regional airlines, industry partners and government regulators. The conference provides participants an opportunity to mingle with the top players in the aerospace industry during a premier event that gives everyone a chance to learn about new products and services. At this year’s conference, guests can expect informative technical sessions highlighting aircraft maintenance operations, safety and so much more! In addition to all of that conference goodness, fun networking activities such as the RAA Golf Tournament, a silent auction benefiting the RAA Scholarship Fund and an evening at the NASCAR Hall of Fame presented by American Airlines are also schedule to take place. 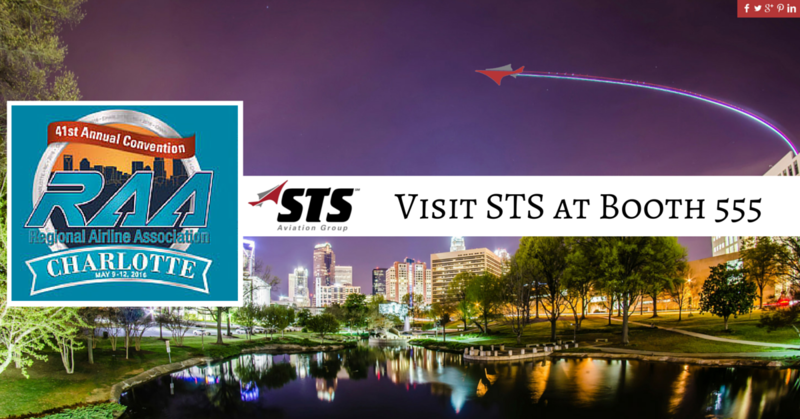 If you would like to visit the STS Aviation Group team during the this year’s RAA Convention, fly on over to the Charlotte Convention Center and be sure to swing by Booth 555.